Four different lots arrived Wednesday. The first we cut into- Indonesia Flores Bajawa Ngura, mid-August crop arrival, organically grown. Peanut-buttery awesomeness, among other things. Available this weekend at Half & Half Cafe, Little Red Bike Cafe, and Eastmoreland Market (retail). Also being served at the Veloshop tent to friends this weekend at the Cross-Crusade in Astoria. We are just getting into this coffee and are four batches deep, so we are still figuring what we would like to pull out in our roasts. We pulled some things to keep two people at the workshop for when the truck came with our new green coffee. With the off and on rain we definitely wanted to move our green coffee fast between the palette at street level and our below ground store room. At 630am I was waking up, Alex was leaving the workshop with a full bike load of coffee, and Matt Sperry was checking in to see what time he should come to work. 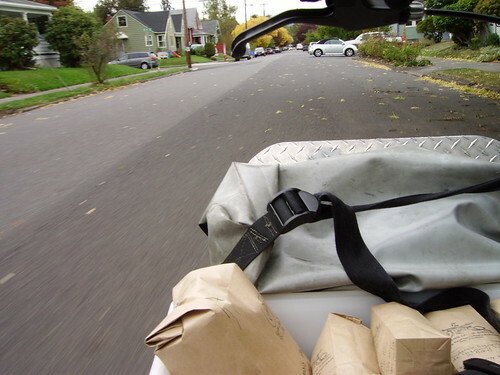 Later I, biking to work with a huge blue tarp strapped to my Sprout Cycles front rack, worry about rain and our coffee shipment, Alex somewhere in St. Johns. Matt came while Alex was running deliveries. 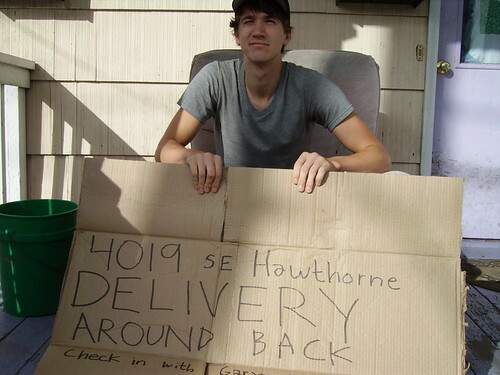 The entire day we checked on our cardboard sign, walking out to look for trucks. We did cup coffee, roasts 10/18 through 10/23. 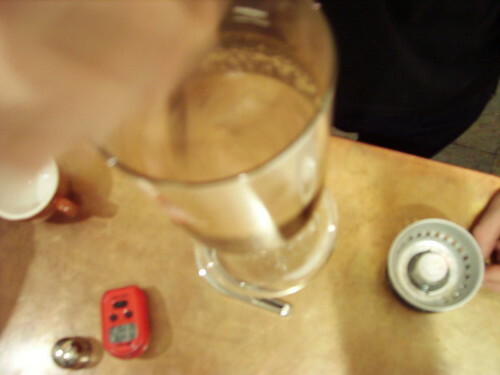 Pictured above a remnant of the cupping. We tasted roasts between the dates listed, we are now tasting everything we send out. 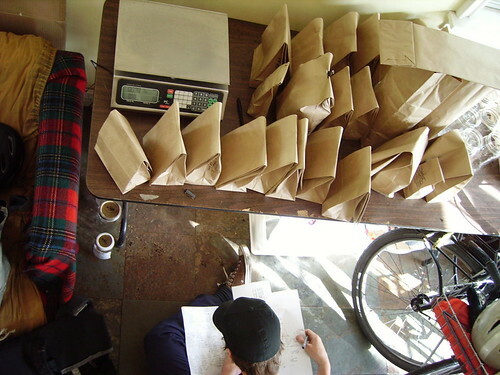 Alex sits on the floor matching our tasting notes with roast times. They tell us the truck will come tomorrow between 9am and 11am. Still time to help us unload! 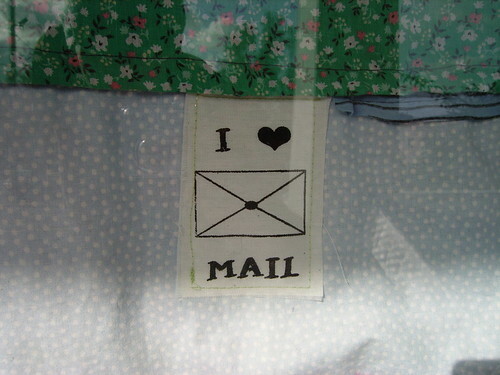 Just got off the phone with our shipper. Our green coffee is in Sacramento and moving up the coast overnight. Tomorrow it will be out for outbound delivery to Courier Coffee. If you are in the neighborhood tomorrow and want to lend a hand all are welcome. We have twenty-two bags strapped on two palettes. If it is raining then tomorrow will be a trick. We have already called in Matt Sperry so the whole CCR crew will be here. Today we siphon-brewed a little El Borbollon, pictured above and below, in Hario TCA-5 siphon brewer with re-purposed cotton cloth filter. Filter hand stitched by Alex Geddes of CCR. Material from Royal Coffee green coffee sample bags. 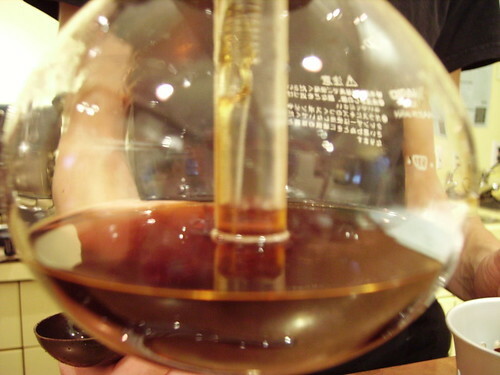 Pictured below the slight vacuum is pulling liquid coffee into the bottom glass. Working to lock down flavor descriptors of roasts we are doing. Alex is getting much time in on the roaster, and we have been steadily cupping all of the production batches sent out. Currently we have been focusing our attention hard on two coffees-Guatemala Esquipulas(town) de Chiquimula(area) finca (farm) las Nubes & El Salvador Palo de Campana (town) finca (farm) Alaska. This gives us time to really explore the coffees and how we are developing the flavors during the roast. When we cup, or taste these coffees, for us, it is super helpful to be tasting many batches/roasts of the same thing and then compare. Perhaps we have been too hyper-focused, and we do have some exciting new coffees on the way, but it has been a ton of fun working so intensely with these two lots. When roasting there are many things to consider. Colors start at green, the green of the coffee seed/bean, and move to yellow, peach, orange, khaki, brown. The texture of the seeds change as they expand, releases moisture and vapor, and swell. Smells from the roasted coffee also change dramatically during the roast, often a sign of what will be in the cup, and also a sign of what is being lost. 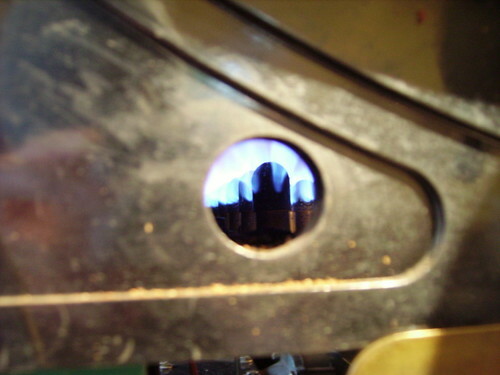 Sound helps define stages of the roast, marking structural development, chemical, and also momentum/speed of the change. These sensory things, along with a log of time and temperature we try and record. Changes in a roast happen in seconds, and sometimes the most critical moment is to gauge when to pull a roast. Both of our coffees at the moment have a ton of sugar, and there is definitely a part of the roast where raw sugars are being developed and later caramelized. I think when more of the raw sugars are present, such as a lighter roast there is also a fruity/citrus quality to them. We have been leaning on the raw sugar side for a while, and we have been trying to drift to more of a medium roast without sacrificing the citrus florals. While there is a ton more going on with super light roasts there is also perhaps more acidity in the coffee and more caffeine. These super light roasts are amazing, but perhaps not crowd pleasers or easy on the stomach. Anyway these are my thoughts for the day, perhaps some tasting notes later. Filling glass jars with coffee, later this afternoon. 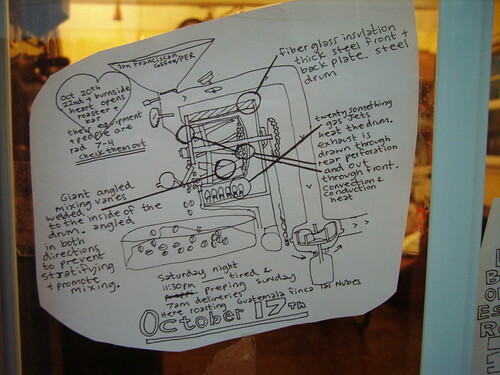 The roaster is still cool, having been shut off at midnight, when we last updated our workshop window. We roast coffee seven days a week. Monday is one of the mornings we drop glass jars full of roasted coffee beans to peoples front doors. We like glass jars a lot. For each jar dropped off, we pick up one empty jar. Jars are taken back and washed in our triple sink with mild soap and hot water, rinsed, and sanitized in a solution of 50ppm bleach. 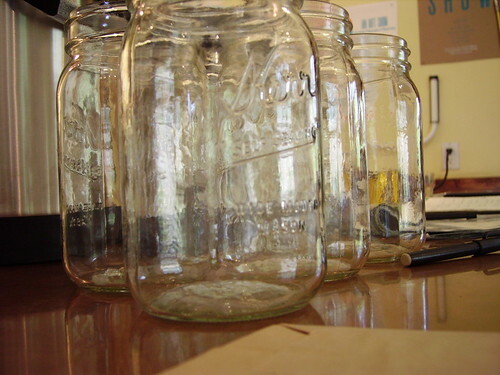 Each jar is checked for cracks, and cleanliness. The jars protect against rain and humidity, and each only sits for an hour or two before people find them. Predawn deliveries start at 4-5am, depending on if commercial deliveries need to be done at that time as well. Jars are heavy, and our morning list is very small, thought out so that it may be done without the use of our heavy duty cargo bike. We love appointments and people dropping by our workshop to pick up their coffee. When people order 24 hours in advance it is super nice. Everyone is always welcome at our workshop, but please keep in mind we are not retail. Eastmoreland Market, Lrbc and H&H all retail our coffee as well, found on our main webpage (not the blog, and we know they are not linked). 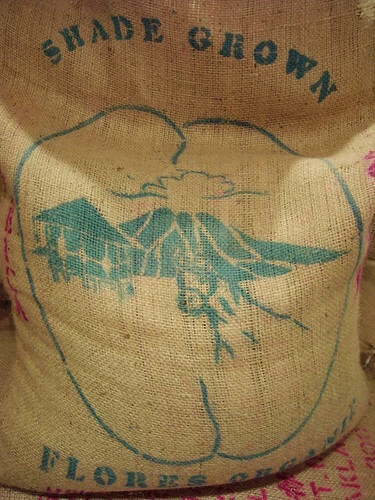 El Salvador, Santa Ana (region), fincas (farms) la Reforma y el Cerro, both run by the Alvarez family, a lot of 100% red bourbon varietal coffee, labeled simply el Borbollon. This coffee arrived August in burlap bags of 132pounds each. We have been sort of sleeping on this coffee from the start. The previous espresso was a single lot from the Delarisse farm in Cerrado, Brazil- Chapadao de Ferro, or big plateau of iron. We have moved from a sweet, sugary, natural process coffee, to a washed coffee. The Chapadao de Ferro, by the way, took second place in the Cup of Cerrado, we are told. Our new espresso is also full in your mouth, and much of this is due to the varietal, bourbon. 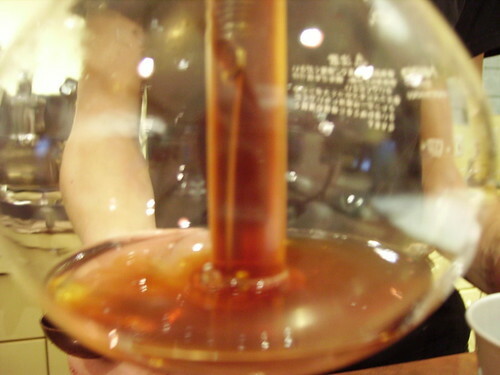 Bourbon is an older varietal. The seeds are fatter, more round, and the sugar in the cherry is distributed a little more evenly in the seed, or bean. Bourbon varietals are very full and well rounded, with a nice depth in the acidity. This coffee we call red bourbon because the cherrys, when ripe, are red, generally the case for coffee cherries, but there are also strains such as yellow and orange, and of course each different varietal of coffee has its own depth of color. This morning, besides roasting a ton, and booking it around town, I got a chance to taste our espresso in action at both the Little Red Bike Cafe, and the Half and Half Cafe. I am so excited for this new espresso. The Chapadao de Ferro was lovely and fun, but super sugary. El Borbollon carries more bass, and also more of a chocolaty depth, citrusy orange. Natasha, of the H&H Cafe, made me a shot that lingered awesomely my entire ride back. I am hugely excited for this new espresso of the future. 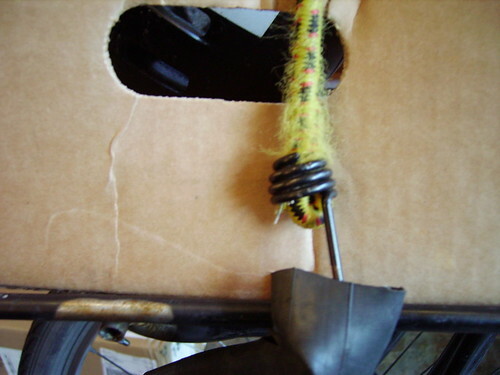 The cargo bike rested in my garage this morning as I was brewing up some El Salvador finca Alaska. Kumquat and orange notes popped in the cup. Brewed Melita pourover, 23 Karat gold plated filter-Swissgold, 2.5minutes, ground with Baratza Virtuoso conical burr grinder. So how to retain the citrus highs while carving out the deeper wine spice notes? We will definitely be thinking about that as we turn out the roasts this week. Six batches roasted this morning. Trying to lock down the perfect roast always. Today we roasted the last batch of our current espresso, Brazil Cerrado faz. Chapadao de Ferro, as well as the first batch of our new espresso, El Salvador Borbollon. Then three batches of Guatemala finca las Nubes were done nicely, followed by one batch of decaf coffee. We have been cupping production roasts a ton, usually 3-4 days out of roast to give them time to open. There was one really spectacular roast of the finca Alaska on the 19th of September that stands out clearly and where I have been trying to work my way back. I have been reducing the amount of coffee I have been dropping into the roaster lately, as well as the initial temperature, trying to gain more control and leverage with my heat. Our batch sizes are now 15-16 pounds, yeilding 12-13 pounds each batch. Average roast time is 12-13 minutes. 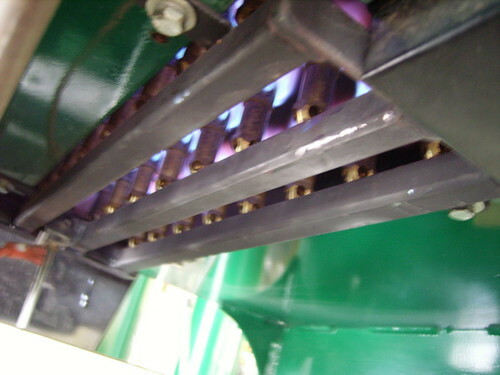 Pictured above is the underside of the gas jets. Last night I pulled off one really beautiful roast of the finca Alaska, followed by one that might not be as classically beautiful. The second roast was pulled shorter than I intended. It has absolutely awesome floral aromatics and a nice sugar sweetness, but is a very light roast. If we had a shop of our own we would definitely serve this, but it might be too light for our accounts. I found this roast super savory and a little meaty, like rabbit, with a juicy juicy body. One cup packs a wallop of caffeine, and i think its awesome, but alas. 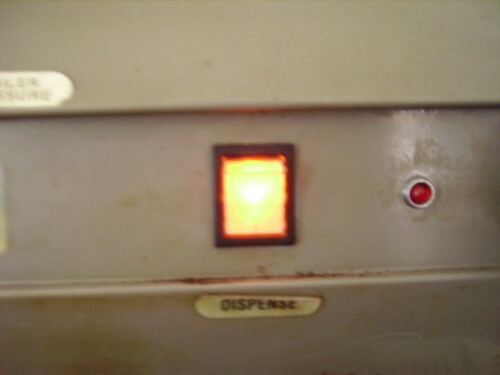 Come over and I will press some up for you. It was a cold crisp day for bike deliveries. My throat is soar from yelling and cheering at the cyclocross races yesterday. Courier biked up coffee and ceramic cups and held down the Veloshop tent. Today our workshop is nice and warm from the roasting. The plan for the day is more cupping and tasting and biking! 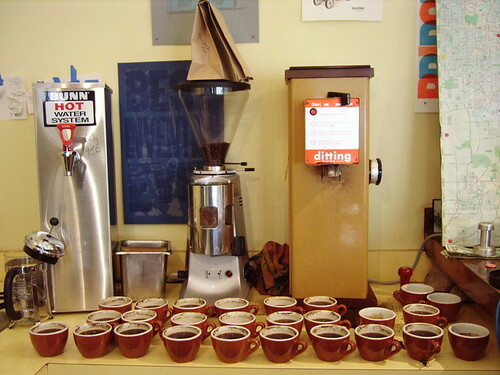 You are currently browsing the Courier Coffee Roasters blog archives for October, 2009.